If you would have told me 10 years ago that someday I would be on the red carpet for a Disney movie WITH celebrities I likely would not have believed you. Red carpets were something for celebrities on one side and the paparazzi on the other, not something for a regular mom. And yet that’s where I was last Wednesday night. 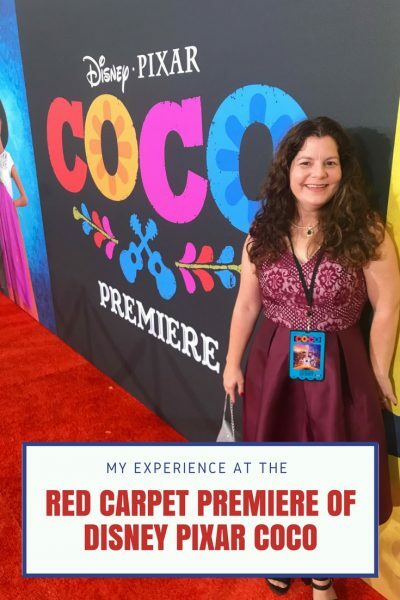 I was at the red carpet premiere of Disney Pixar COCO. I started blogging in 2009. I had a party business with superheroes and princesses. My characters would go and entertain children at their birthday parties. Unlike any other party business when my characters returned to their ‘castles’ they would blog about what it was like to be a princess or superhero at the child’s party. It was a magical time. After a year or so I also started Jersey Family Fun. For a while, I managed both until Jersey Family Fun grew to the point of needing my full attention. 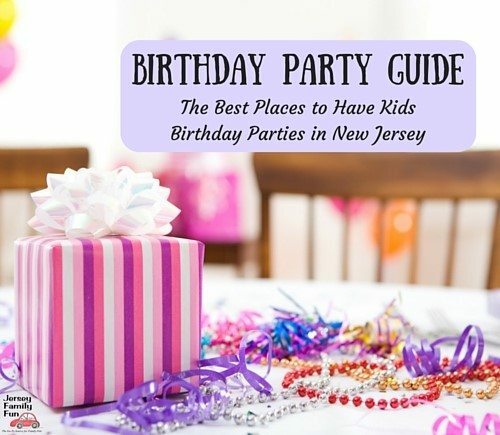 At Jersey Family Fun we always are sharing with you ways to have fun with your family both at home and while traveling across NJ and our region. Family movie nights are one of the ways families have fun together. We watch movies at home together on the couch, in our local theaters, and even in the car on the way to our next family adventure. It’s great to escape into a movie with our kids. Since 2011, we’ve been sharing with you our reviews and information about family-friendly movies. You, our readers, have been so supportive of that, thank you. Our family entertainment series has grown and with that so have our opportunities to share with you giveaways for movie tickets and Netflix DVD.com gift cards as well as new content and exclusive information about new Disney family movies. This year, I have been blessed with three Disney press junkets. 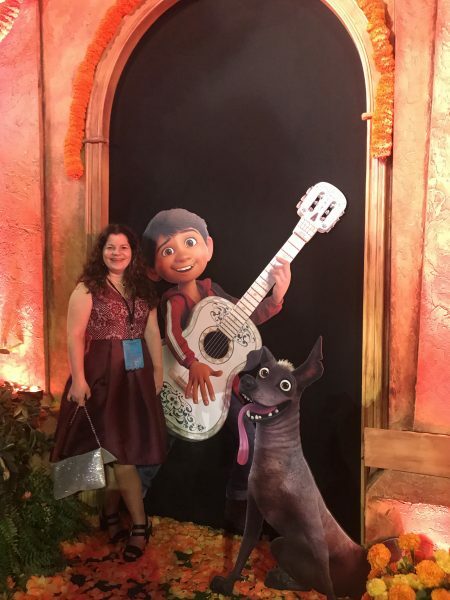 Each of them have been magical one-of-a-kind Disney experiences, the best having a red carpet experience at the red carpet premiere of Disney Pixar COCO last Wednesday, Please allow me to share my favorite moments from the night. Getting all dressed up and fancy. 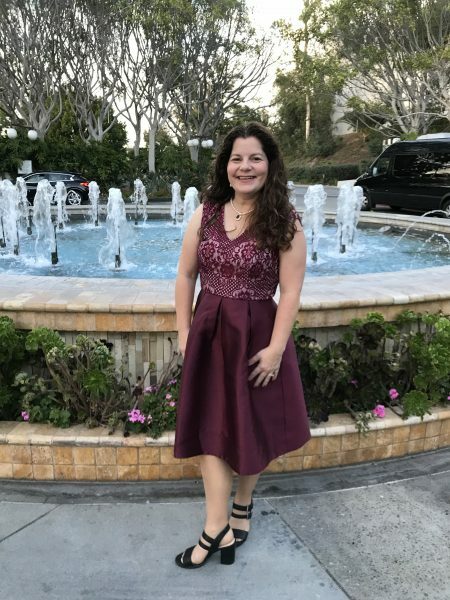 How often do we as moms get the chance to step out of our blue jeans or yoga pants to get all dressed up and pretty? While I might have stressed about what kind of dress to wear and how to zip it up by myself in a hotel room it was still quite wonderful to be able to have a reason to do so. Having butterflies in my stomach. I know, who says being nervous is a good thing? For many it’s not, But being nervous is also a sign that you care about the situation. You are invested in it. You’ve worked for it and you want it to go well. That was definitely the case for me attending the red carpet premiere of Disney Pixar COCO. Crossing through security and into the magical land of COCO. Walking through security and onto the marigold path it was like walking into one of the opening scenes of COCO, There was music, There were dancers, It was vibrant and it was colorful. 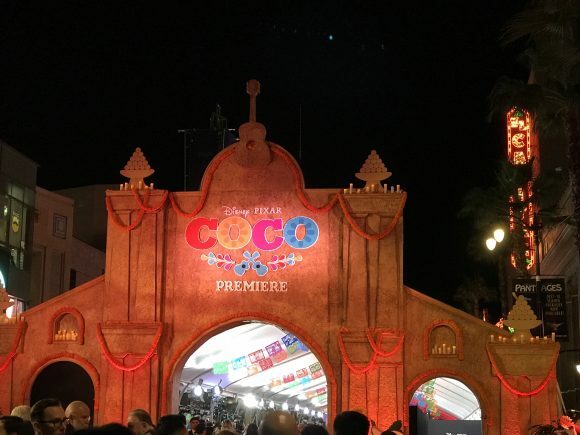 In our interview with Benjamin Bratt, he described the red carpet premiere of Disney Pixar COCO as the best he’s ever been to. Having a photo buddy or two. Our leader, Disney publicist Marshall Weinbaum, recommended we each have a photo buddy while at the red carpet premiere of Disney Pixar COCO. A photo buddy is someone who stays with you and is ready and willing to take pictures of you when you want. I am so thankful for the patience of my photo buddies. I had them take lots of photos of me. Seeing the joy in my friends. Several of the Disney bloggers on this press junket have either roots in the Latino and Mexican culture or a strong connection with it, Their faces lit up to see other Mexican and Latino celebrities. They sang with the Mariachi music and danced with the dancers. They radiated such joy. It was an honor to be a witness to that and to know that Disney made that happen. 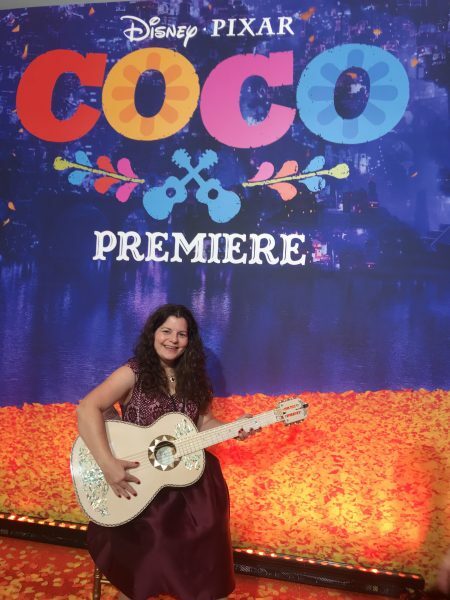 Holding the real guitar that was used in COCO. 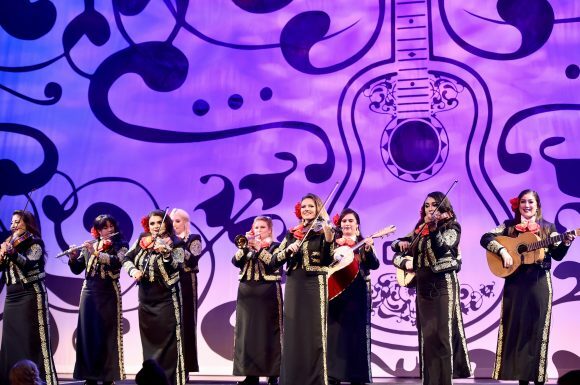 Federico Ramos, one of the guitarists for Disney Pixar COCO, was generous to let some of us take a turn holding the guitar. He even took some time to tell us how the COCO guitar was crafted. Going into the Land of the Dead. If you read my posts about the Beauty and the Beast press junket you know one of my most memorable experiences there was being serenaded by Lumiere with the Be Our Guest song. It may have only been a virtual reality experience but it still left an impression on me. 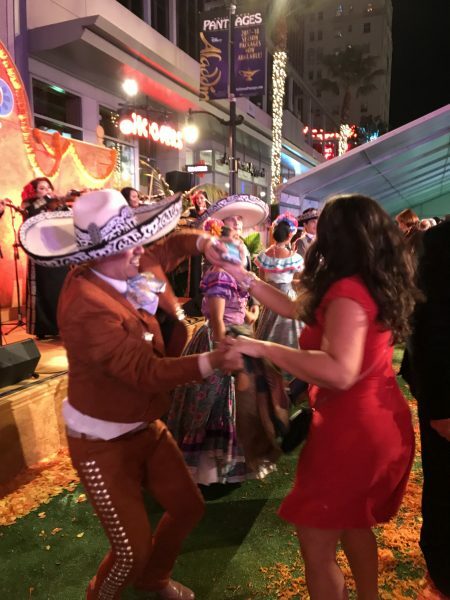 As did walking into the Land of the Dead during a virtual reality experience at the red carpet premiere of Disney Pixar COCO. I was able to walk through town, get views from high and low. I traded heads with a skeleton and took a virtual selfie with another one. Then I flew some paper airplanes off a balcony in the Land of the Dead before returning to the Land of the Living. Eating the same authentic Mexican foods as in Disney Pixar COCO. 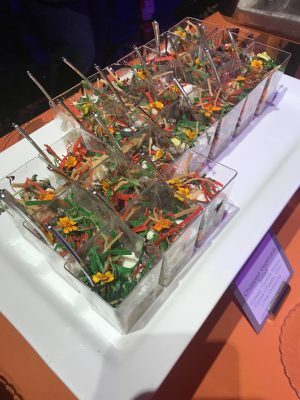 You eat well at Disney events and often the menu is inspired by the movie. At the red carpet premiere of Disney Pixar COCO this was no different. The buffet offered so many Mexican-inspired dishes. Kids made candy skull cookies, sipped Abuelita hot chocolate, and munched on colorful cereal bar treats. 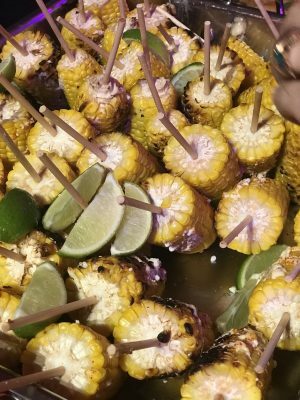 As we watched COCO it was neat to identify the food we had just eaten in different scenes in the movie. Watching Disney Pixar COCO with the talent that made COCO happen. Red carpet premieres for a film are attended by the stars in the film, the directors, the storywriters, the animation artists and more. Almost everyone involved in a movie attends and they bring their family with them. 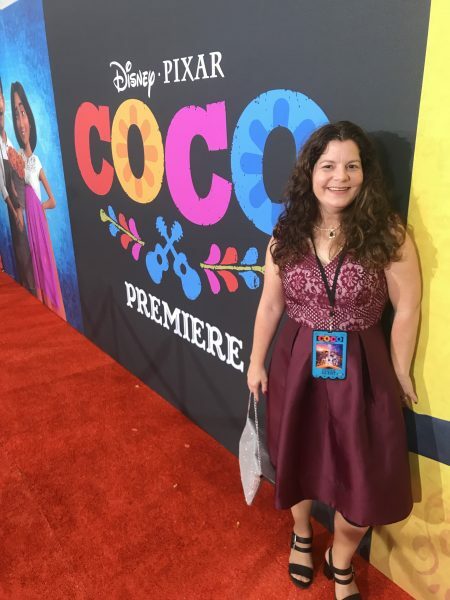 At the red carpet premiere of Disney Pixar COCO, I just couldn’t help but to keep looking around. I wanted to see who I could I see. Who would I be able to identify? I was in the second row of the theater. Seated behind me was Actress Selene Luna, voice of Tia Rosita, for Disney Pixar COCO. A few rows behind her I could clearly see Anthony Gonzalez, who plays Miguel, seated with his family. Anthony looked clearly overjoyed to be there. I will share more about his enthusiasm in my blog post about our interview with him on Monday, November 27, 2017. Of course, who can blame Anthony for being so exuberant? 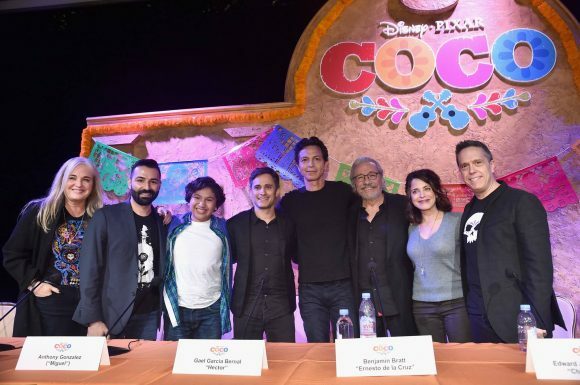 Disney Pixar COCO is a film worth seeing and celebrating. 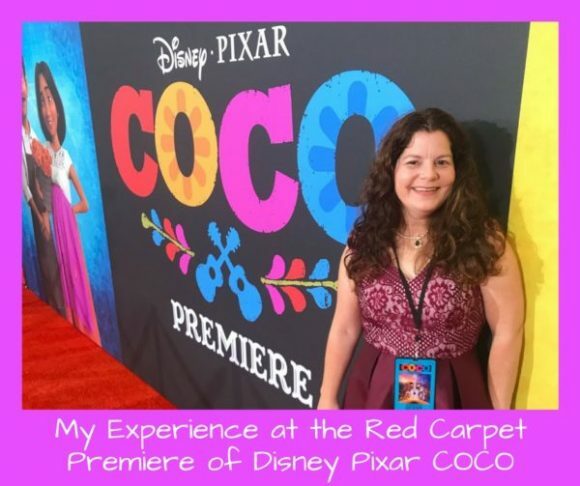 I am so thankful for my experience at the red carpet premiere of Disney Pixar COCO. I can not wait to share more about this fantastic Disney film and our interviews with the talent behind the film. See more photos from the red ‘marigold’ carpet for Disney Pixar COCO in this Facebook album. 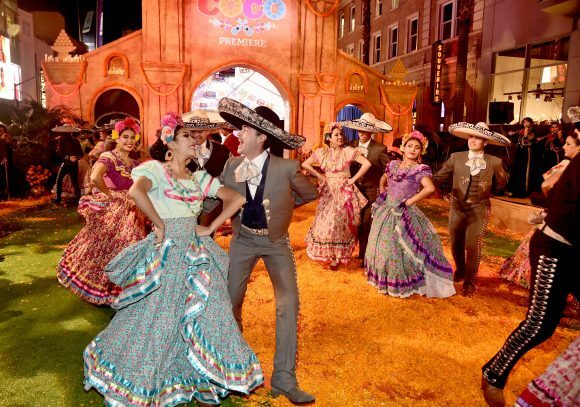 Want to see more from the red carpet premiere of Disney Pixar COCO? I found this video on YouTube to be a good recap of it all.